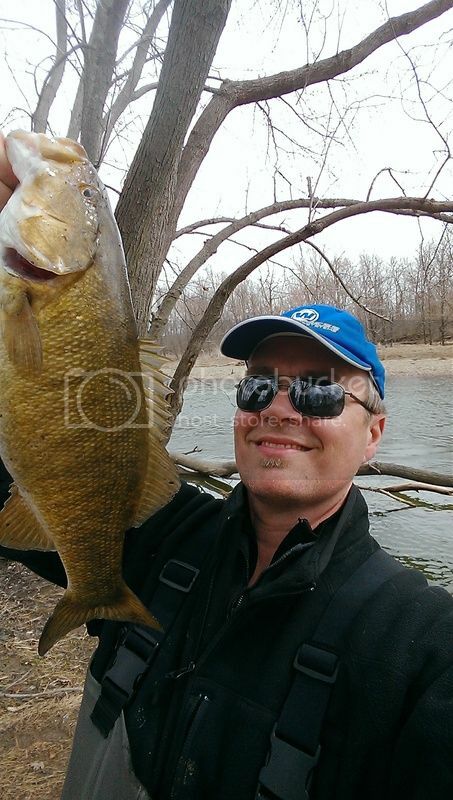 I've been fishing for river Indiana Smallmouth Bass very heavily since 2005. 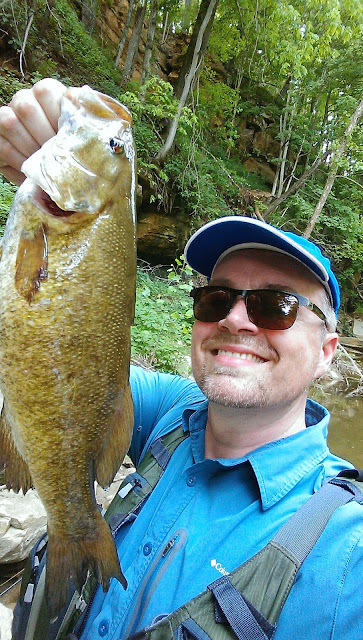 I've landed smallmouth bass from over 50 Indiana rivers and creeks. 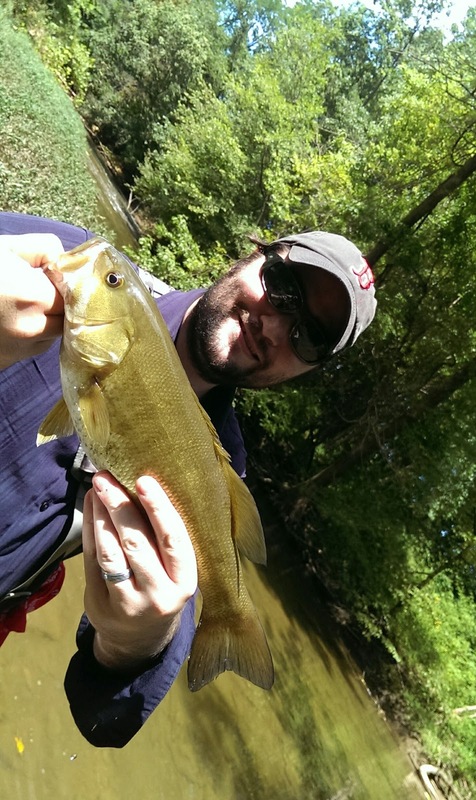 Caught a smallmouth from 11 rivers and creeks in one day. In those 10 years, I've brought nearly 11,000 smallmouth bass to hand. With 60 going over 20". I've come close to 22" on two occasions, a hair short on each time. 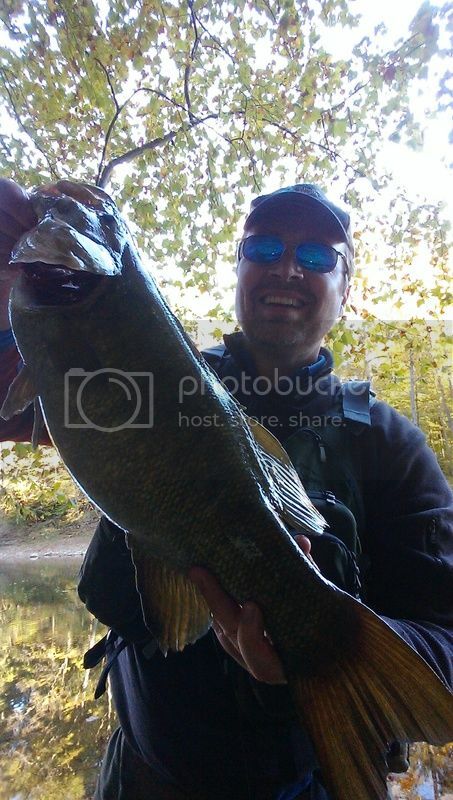 An Indiana river fish approaching 23" is something I'd joked about retiring over, but I meant it. I'd written off the chance of it ever happening. 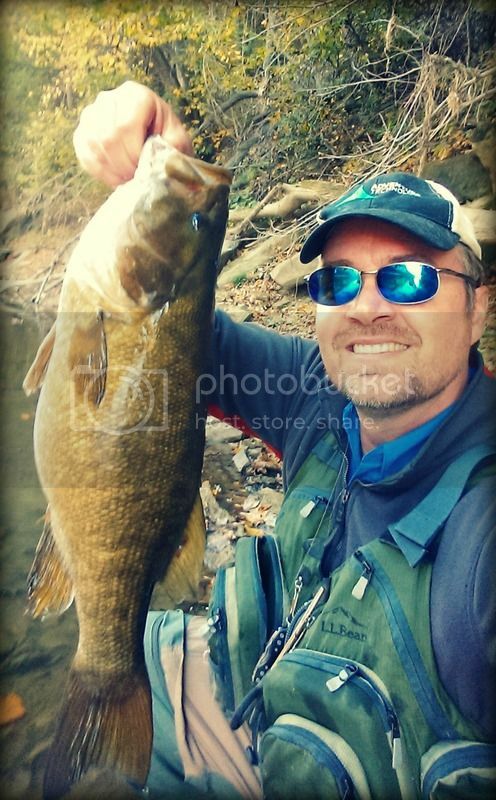 My fishing time limited the last two years, I none the less headed out for a wade one Fall afternoon. Fallen leaves were a factor, the stream wide, and shallow. Water levels very low, necessitating sneaking softly afoot. 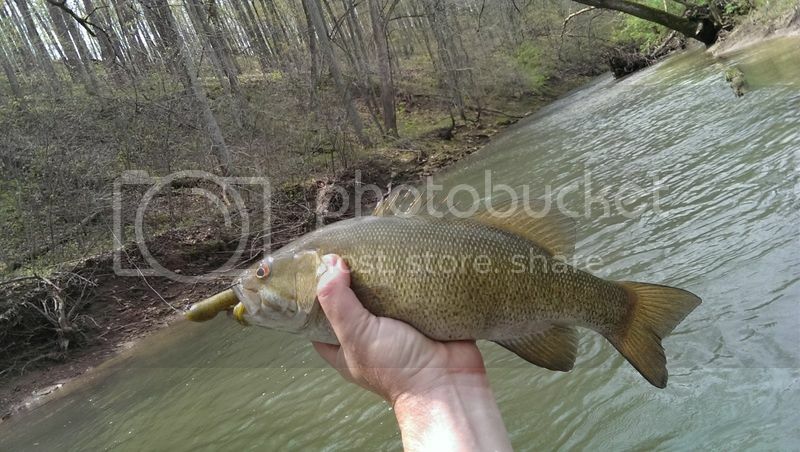 The sun made the fish very skittish in the clear water and the shallow runs populated in warmer times of year were mostly empty, if not close to a deeper Winter over hole. I made long casts with a Sammy 100, a lure I'd consider myself an expert with. 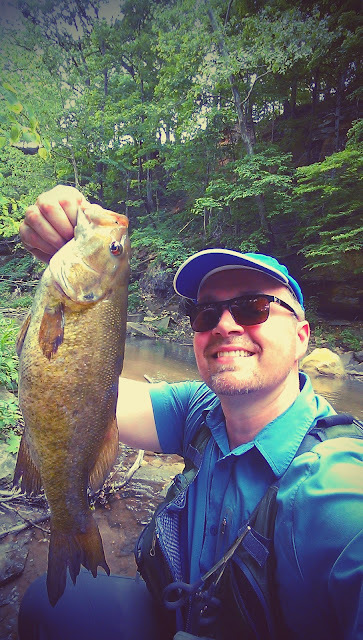 It's fun to cast, throw it a mile, skip it under tree limbs, basically, don't spook the fish by casting a long way to get to them. Make lots of accurate casts, let the action do the work. 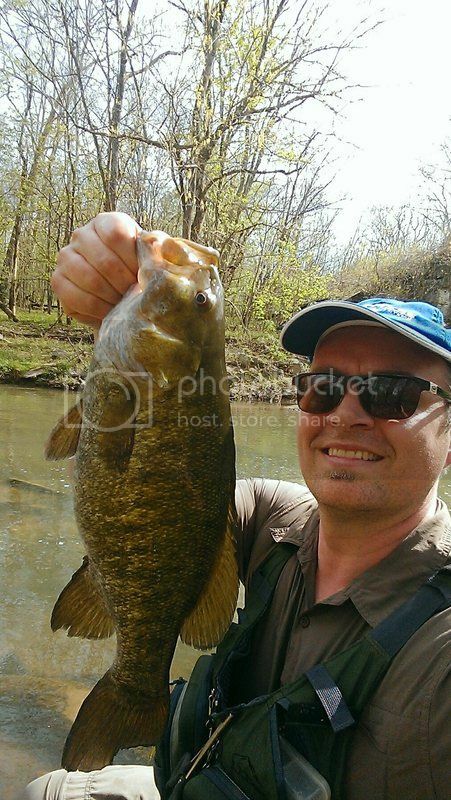 Hundreds of big Indiana Bass on this lure. 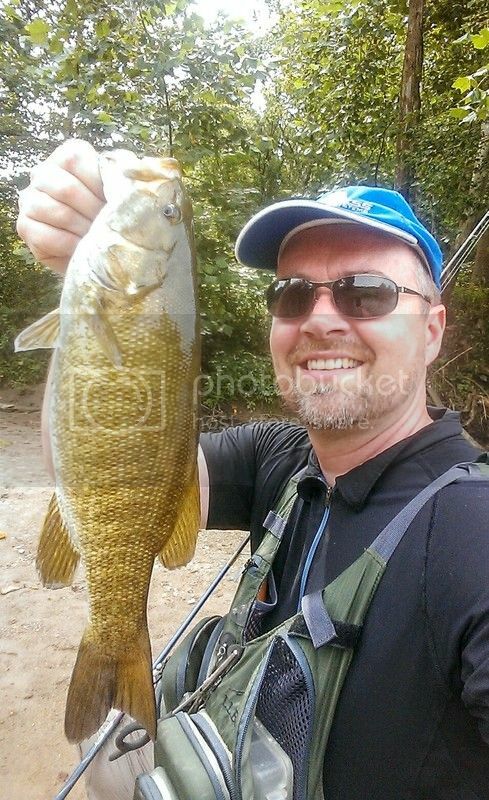 A handful of spunky smallmouth came to hand at a large pool filled with fish. In pools like these, gaining an overlook can tell you everything about how to fish it that day or in any future trips. I saw hundreds of rough fish suspending in the deepest water, 3.5'. To one side of the 70 yard wide pool were some laydowns. I approached and lined myself up to bring the lure straight down a log parallel to it, when a breeze to the lure well left of the intended target, I had to steer my rod right quickly. This caused the lure to land at the end of the log rather than the front. 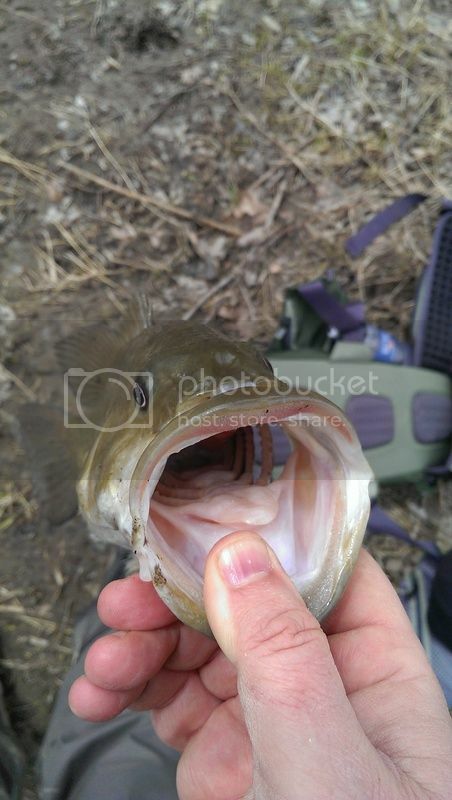 To my surprise, it was immediately nailed by a large smallmouth. I'd guess in the 19-20" range. It quickly got airborne before I was ready and was gone! Tip of the hat to that one. I started to really get into some fish at the top of this large pool from dink to 15", when the river turned and the sun got very low. I had turned a corner and the 80' cliffs now covered the river in shadow. Worse the low sun made it so I could read nothing in the water. Almost blind. At the turn and cliff was another shallow pool. It was filled with fish. They were hitting and missing the Sammy in the low light at a very pleasing rate. I rang them up along that cliff wall like the Terminator. Maybe a dozen all told. Then I started casting towards midstream and a disturbance upstream. Woosh, Woosh, Woosh! A very large fish came out of the water on three occasions in the first cast. I was stunned by its size. I make another cast, Woosh, Woosh, Woosh, fouled on a leaf. Recast. Woosh, Woosh. It's the same big bass chasing. Only this low light is giving us both a hard time. 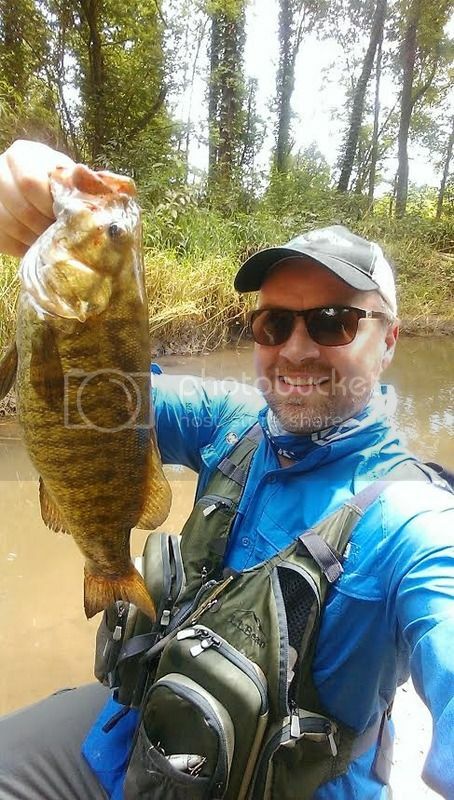 On the next cast, I bring in a 15". Smallmouth must be chasing baitfish schools. Moving up 50' or so, I duplicate the idea in the earlier failure of bringing the lure side by side with a laydown. Woosh, Woosh. Leaf. Quick recast. Woosh, (nuts!) Thunk. Fish on this time! Judging by the bend in my rod, a monster. The fight is incredible. For a moment, I'm wondering if this is a stray muskie. After several long runs, the fish is in sight and it is truly huge. 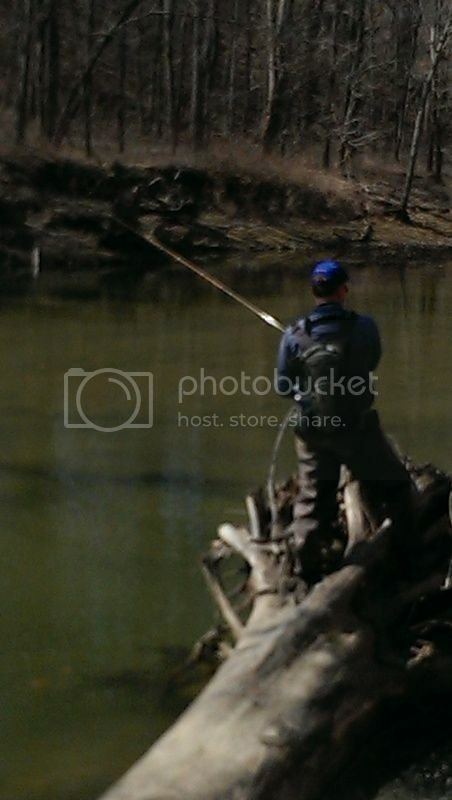 I notice only one hook is in the lip, so I am walking towards shallow bedrock to get the fish on its side quick. I haul the fish there with all the protests you might expect, when suddenly, the hook pops out. I'm on it quick. 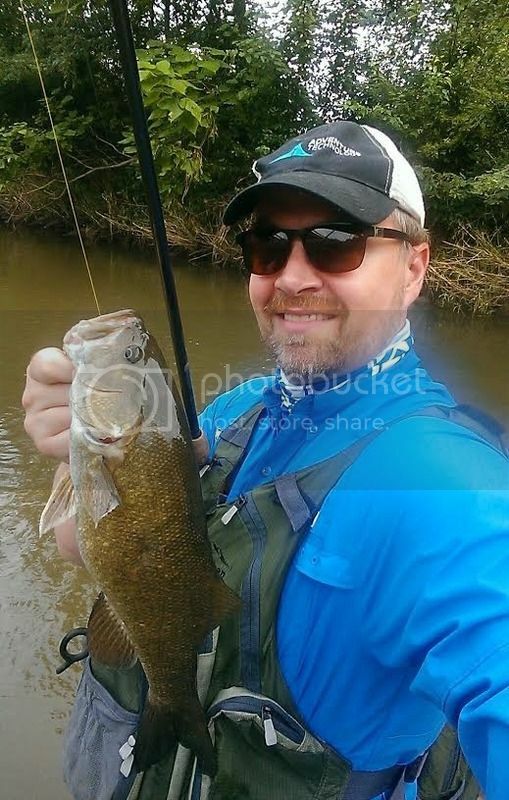 The largest smallmouth I've ever seen. Seems nearly 2' long. When I lay her on the rod to measure her, she well exceeds my 21" mark and the 22", unused, has rubbed off over time. I take out my sharpie and carefully mark the fish's length, tail pinched and mouth fully shut. When I get home an hour plus later, I walk into the garage and lay the tap to my rod mark. 22.75". No need to retire! I have to say, nearly 2 months later, I'm still on Cloud 9 about this. Man, it has been a lot of effort! 3 hours 13 bass (19.25", 2-16",15") 19" channel cat, 5 rock bass on tubes. 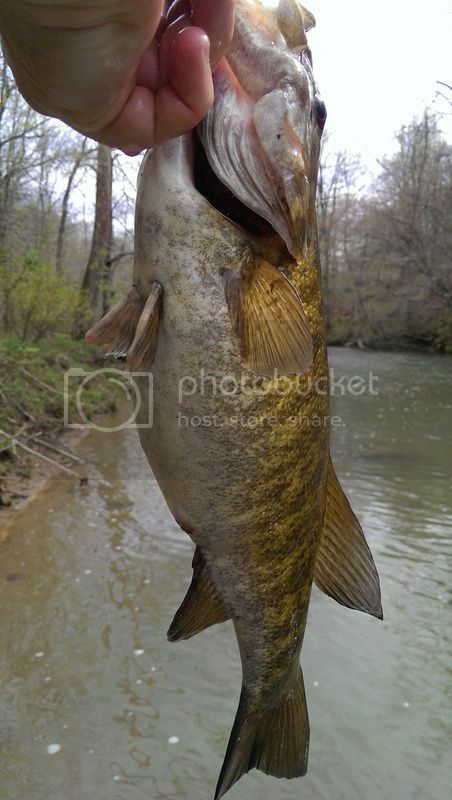 So next week is the INSA Camp and Fish near Lafayette, IN. Been getting back into fishing shape. 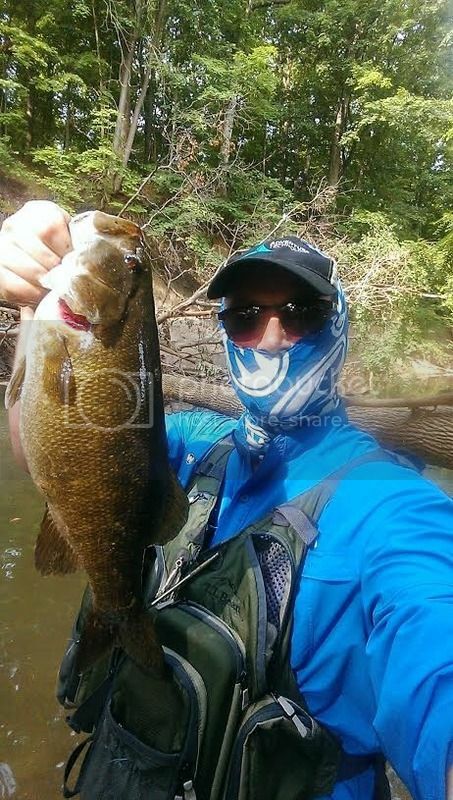 Thankfully, been a finesse bite and not run and gun topwater. I've stayed on smaller streams to keep in the shade so I don't wilt. On Saturday, I headed in the direction of a cluster of medium to small streams, sort of late in the morning so I thought I'd take my chances. 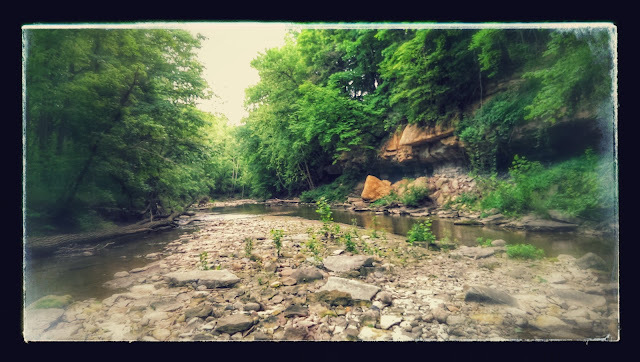 On the drive, I decided to hop a few streams, The first stream I had long ago written off as sand filled ecological disaster. 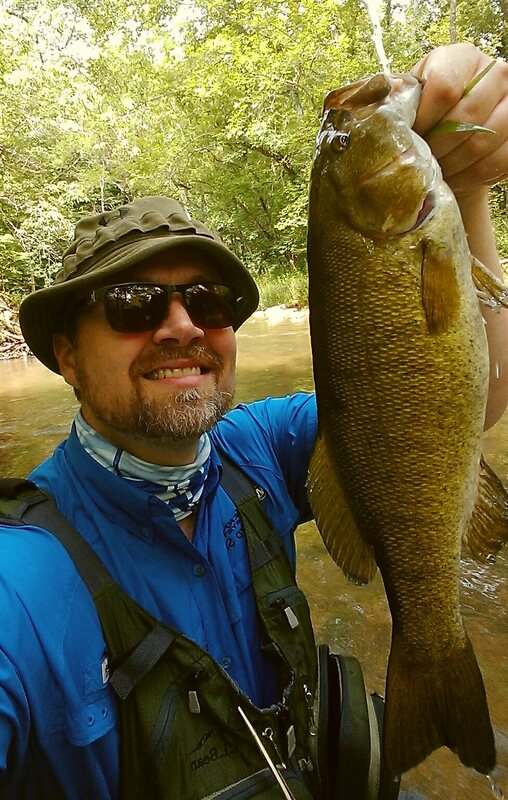 But last time there I pushed past the one good hole I knew and found if I was willing to walk a long way on shallow water, deep sand (exhausting) I would arrive at some holes filled with hungry smallmouth. 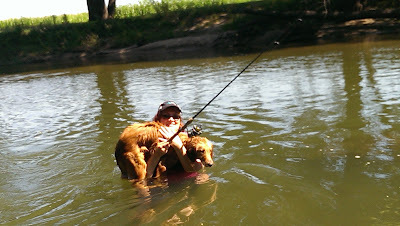 It was this event that convinced me to get out much further upstream on a public highway and try to fish. Brand new water to me. This is always very exciting. I looked downstream and saw rocky cliffs, rocky riffles, and smallmouth under the bridge. HA. I did what I almost never do, I waded downstream, keeping in the shade and bedrock and I probed any depth with a 3" fat tube. The creek was very shallow. And I mean VERY. Rarely more than shin deep, but always some shade. I passed some wild turkeys which scattered off at the sight of me. 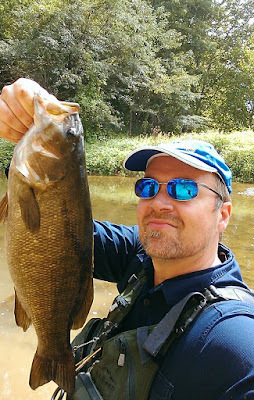 At the first riffle, I started catching smallmouth bass on the tube, it only let up all day, when a hole had given up her goods. In the strange twilight, I could silently get pretty close if I stayed low while the fish were in shade. 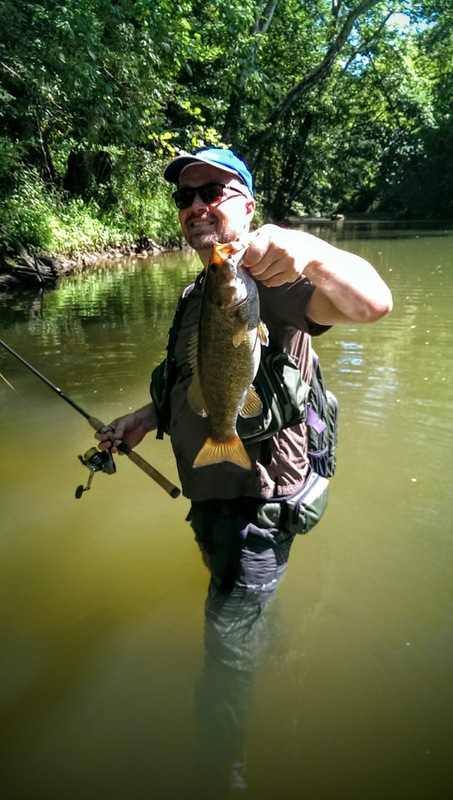 Longear sunfish constantly harried my lure. Peck, peck, peck, peck, drop, repeat. 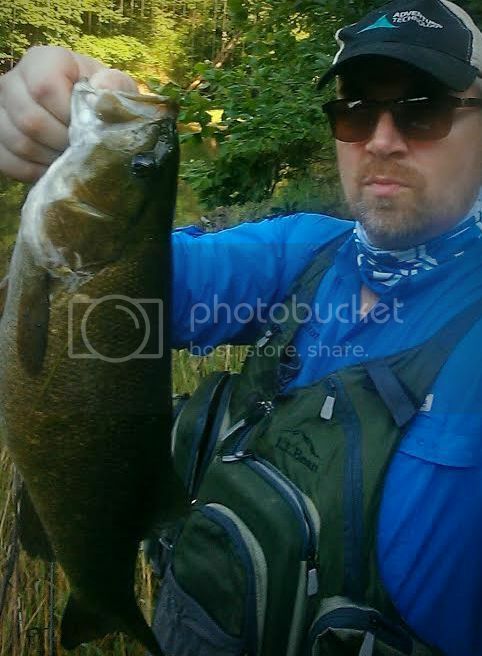 Lots of nice fighting 12-14" bass. 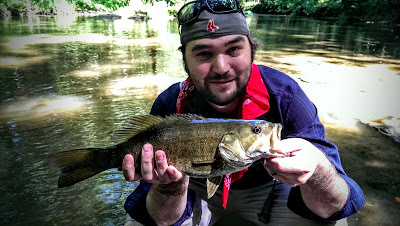 I was missing out the larger fish until I headed back upstream and fished straight up the creek on the scour side. 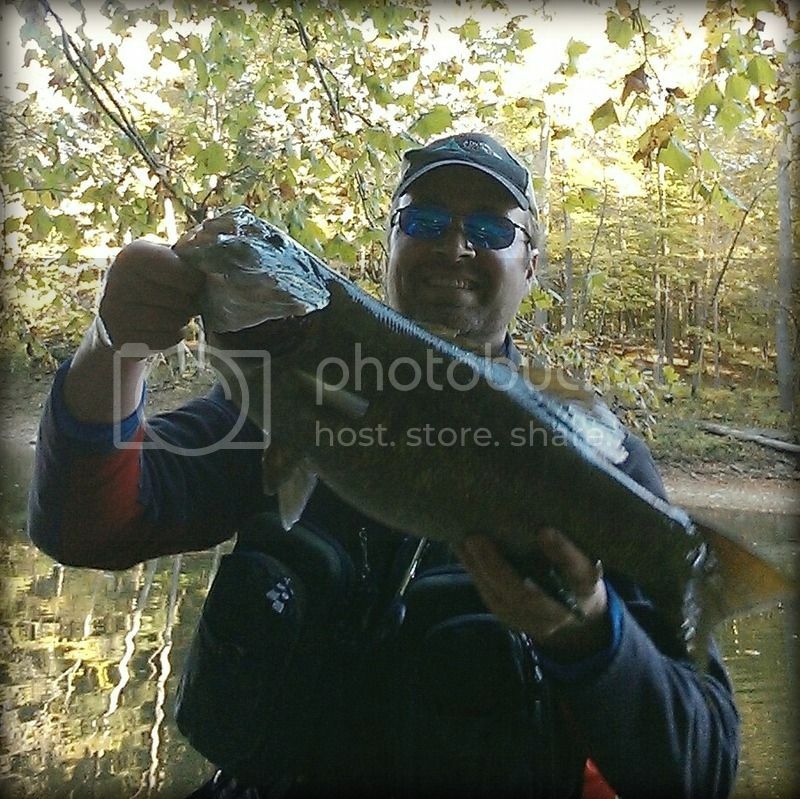 This produced a 17.75" bass that fought like a demon on my loosened drag. Because of the unique shade conditions and bright sunlight, the fish didn't spook very easily, if they were in the shade. I could nab one after another. And did. 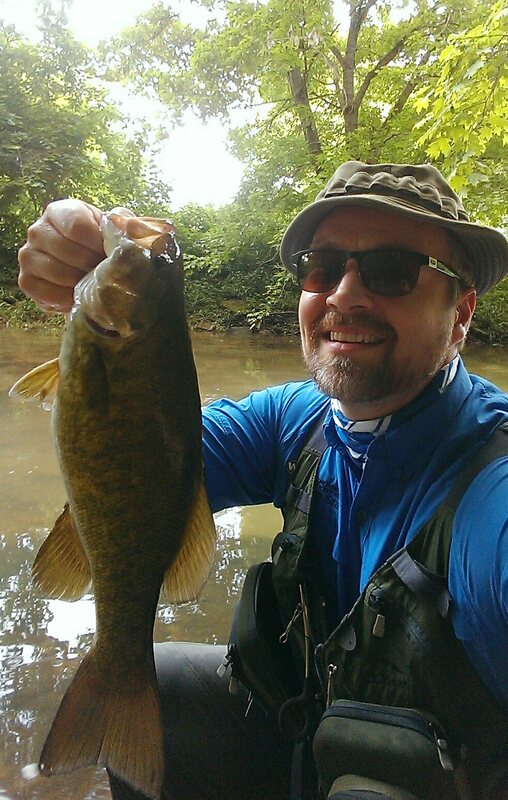 I had 29 smallies by 1pm (started at 11). I had caught 17" fish in this creek before, but in several tries had seen nothing bigger. When I fish a creek, in my head I'm ranking the upper limit on size of the larger bass based on what I see swimming around and what I hoover up on long wades. Judgement was this creek would be lucky to see an 18"er. The growth rates regionally are very good. Holes aren't very stable(or deep) and there seem to be lots of bass. Also Suckers were on the small side for Indiana. This could be an indicator of a catastrophic flood, or slow growth because of overpopulation. I was catching fish on tubes, tubes, tubes. A 16" here or there until hit an expanse of straight, silty,sun lit run. I caught a couple bass and spied a shallow combination of sycamore tree scour holes and shad from those trees. All day those proved the ticket. They provide a house to hide under for bigger fish and hold most of the depth. I did find a couple of 5' deep log piles, but these holes would be lucky to go 2' deep. They have shade and shelter. 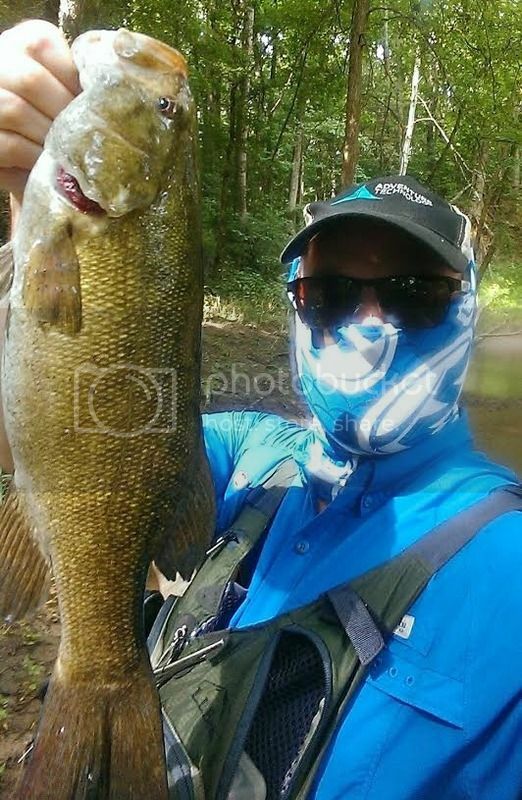 So fishing this shady are with tube I start banging nice fish in the 14-15" range which put up incredible fights. 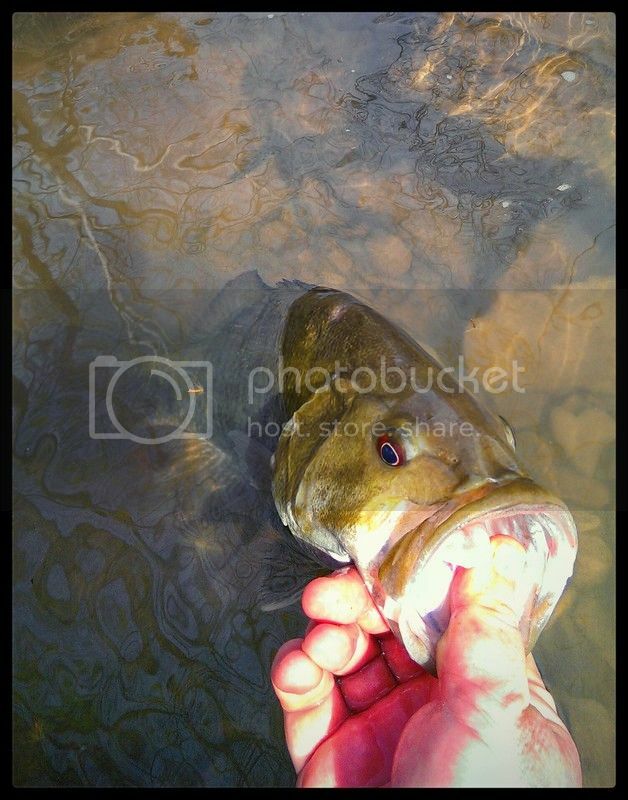 Then Big Bertha hits, she's chased by three other bass, one a largemouth. I hope that she's hooked well. 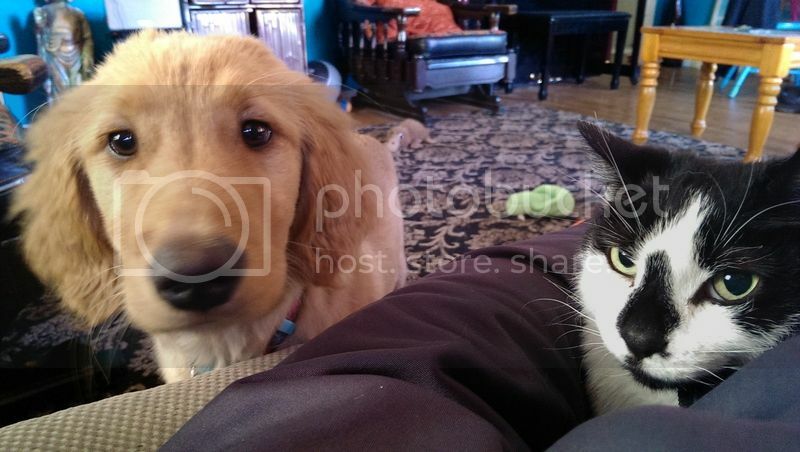 She looks really fat. I beach her in some shallow sand, grip and she's hefty enough, but alas, under 18"! 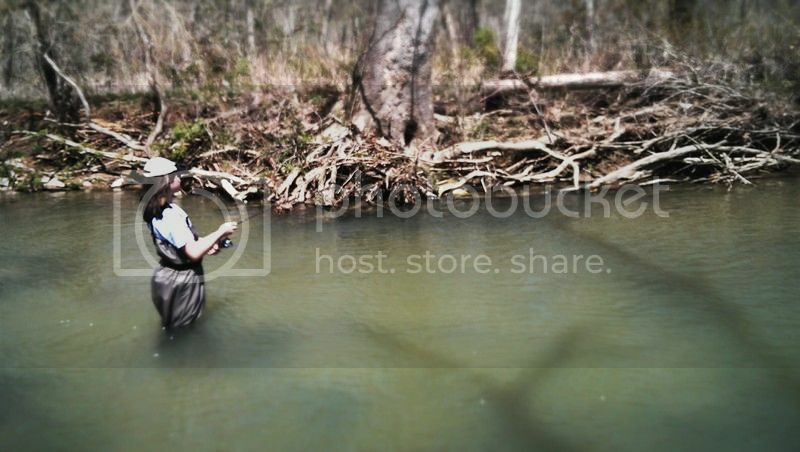 This is basically my dream, find a new stretch of creek or river, every bend and hole a mystery, unfished. The anticipation powers me on past where most people would quit. 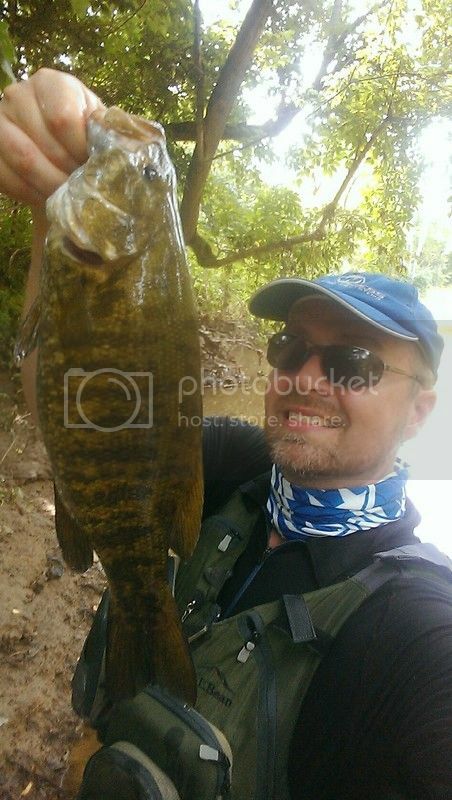 After landing this fish, on the next cast the water erupts and I'm afraid I have got my 18" smallmouth bass! This quickly changes as I see immediate death rolls and realize its a big catfish. It's funny. I 've caught channel catfish all my life and sometimes I still balk at handling them. 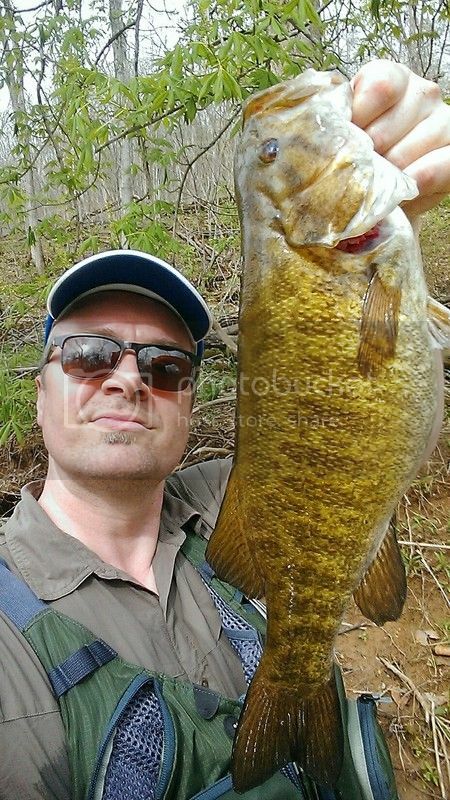 This one was nearly 2' long from 2' feet of water. I didn't want to get slimed or poked so I let her go without a picture. 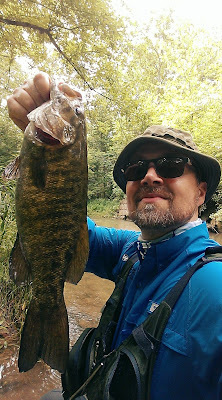 I'm up over 52 Smallmouth and 20 other fishes, out of water and about exhausted a quick creek bath, lowers my body temperature. 7 hours of constant walking in the sand and rock has taken its toll. I clip on a Lucky Craft Wake Crank and begin the long walk back down the stream, using my sense of direction to cut much of the distance through the bean fields, which a farmer has managed to mow around the lush crops. Allows me to cut off an hour of walking. 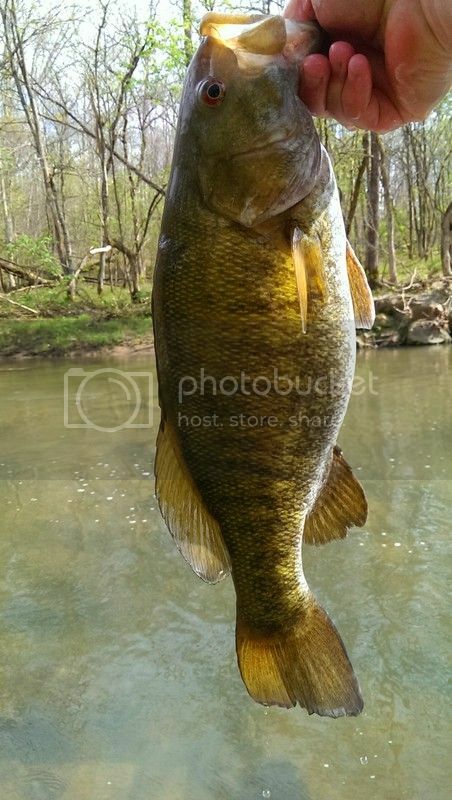 The bass are more active at 6 on the way back I land 7 more smallmouth including another 15" and 16". Just awesome to have all day, all the time action, from these noble, hard fighting fish. 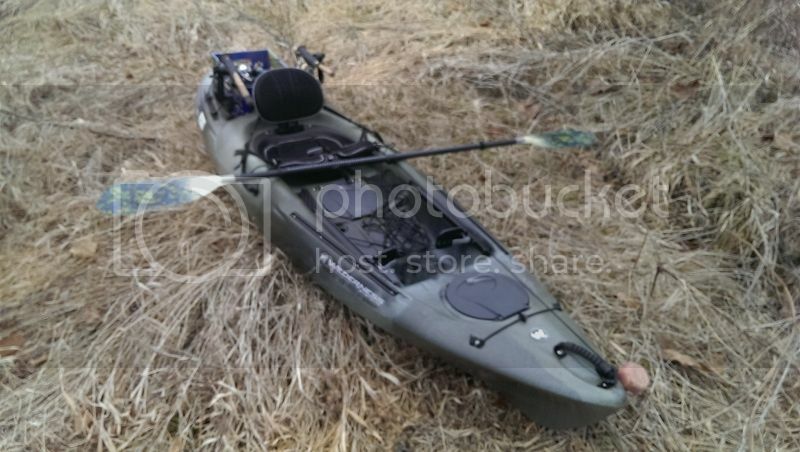 59 SMB (2-17.75", 4-16"-16.5", 4-15") 24" channel catfish, 2 green sunfish, 16 rock bass. All that, an hour away from Bloomington. Next, Camp and Fish and the return to big water and kayaks. I've got a new Wilderness systems boat to show you all I bought this Spring. 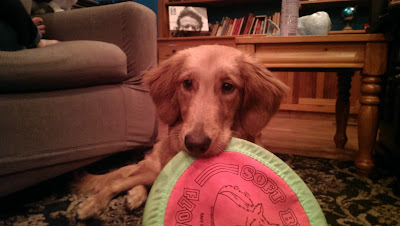 Meet Charlie, she's my 8 month old golden retriever. She, uh is really smart, which is great. She's also filled with moxxie, which is sometimes great. Took William the Coworker fishing with me because he had a rough week. He hung in there all right, even caught some nice fish. 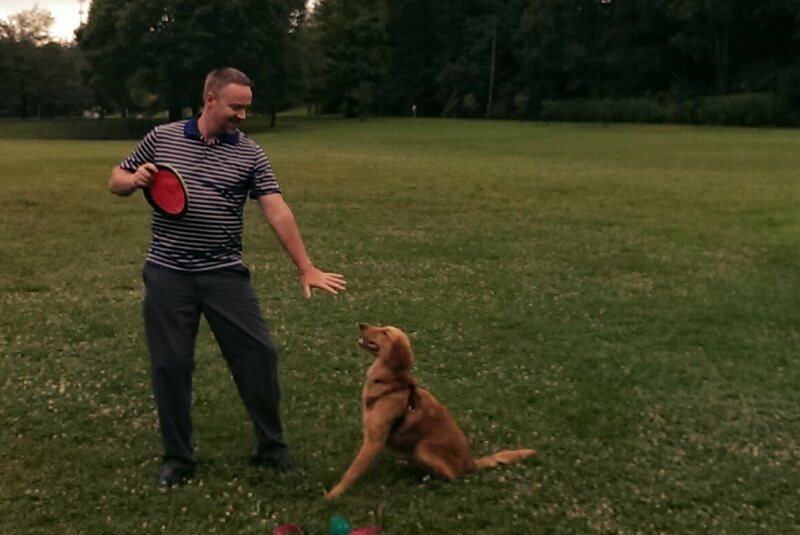 Being left handed will help him wading streams. Seems like I'm always walking up the right side. Maybe something to do with streams generally flowing south. 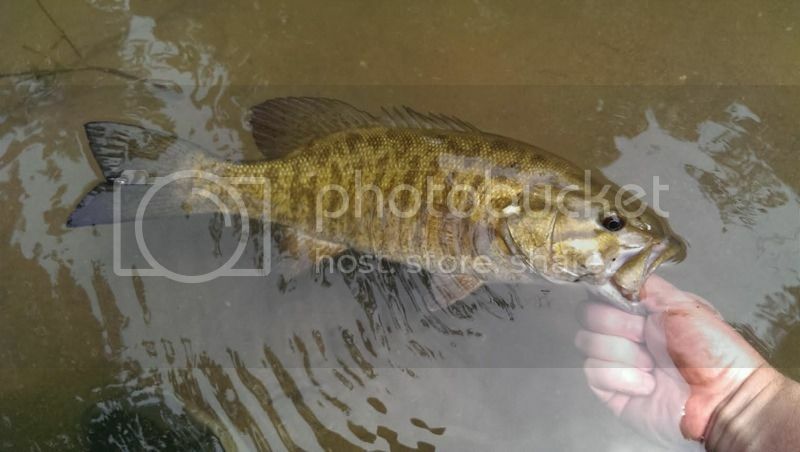 I think I ended up with 19 SMB 17.25" 8 rock bass and Will 10 or so, with a three over 16". 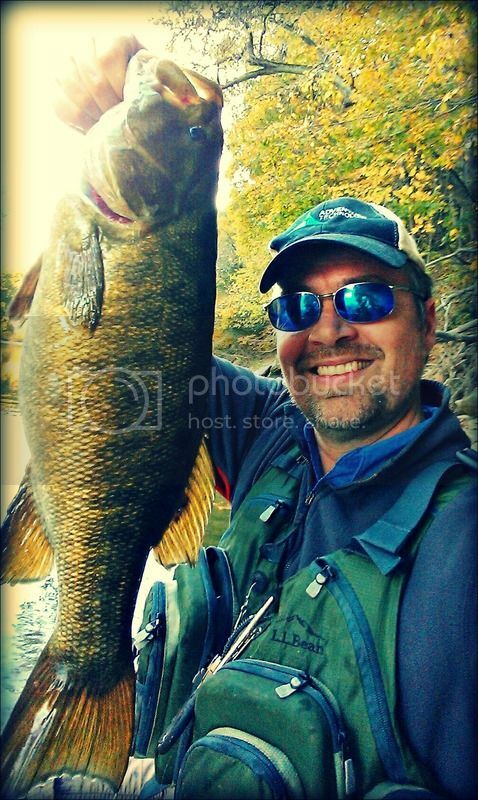 His 16.5" was a "five pounder". HAHA. Was roughly half the speed I would fish. I would have loved to have tried for a repeat of last Saturday on a different stream. Sometimes it isn't about the results, but the journey. On Memorial day, got a flat tire on the way to float. Next, my river was filled with rec canoers. Headed home, passing over a small tree lined creek 30' wide and less than two feet deep. Figured what the heck, there's got to be a fish in there. 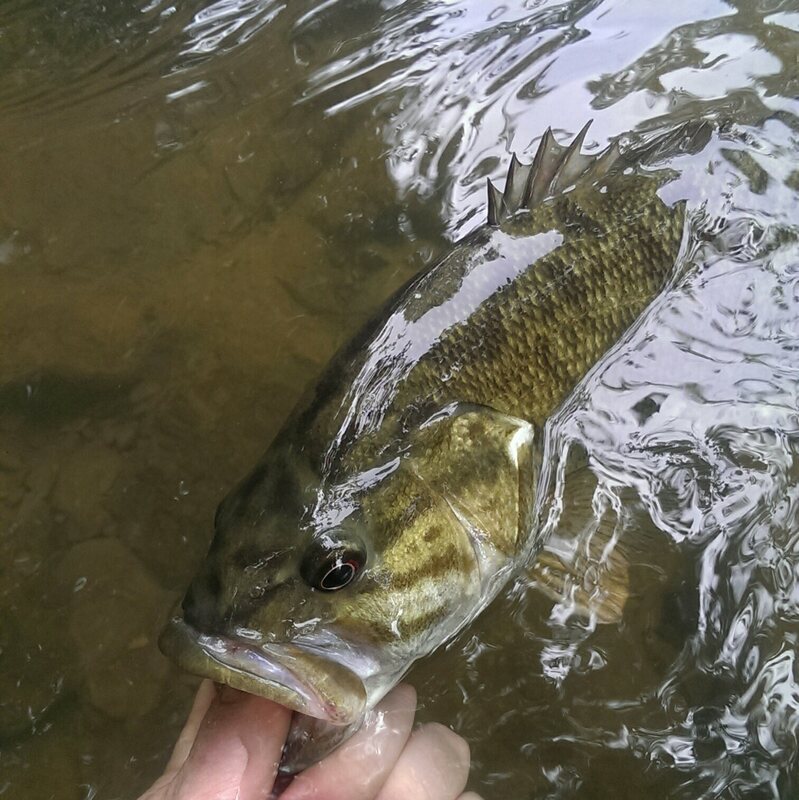 😊 Of course, I found small stream goldmine to the tune of 27 smallmouth in 4 hours. 2-18", 2-17", 3-15" Looks like I caught the same 18"er again on the way back up! Catch and Release! Sorry for the hiatus. I have been busy. Busy with a new career, a new golden retriever puppy, and a long recovery from the flu that has still zapped me of my strength and energy 5-6 weeks later. My health hasn't been the best in 2015. Having a hard time getting all the way back to charging hard. The other bit is having to be on call for a couple of weekends a month. Have to stay in cell service. I made one such trip on the 18th water was up and pushing. The most beautiful Spring day I can remember. 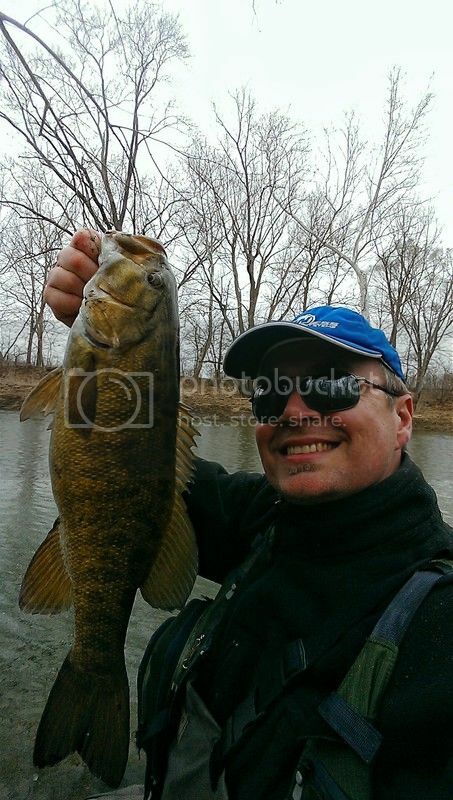 This continued with chunky spotted bass and smallmouth. The tube bite kept my pace slowed. Just what my lack of strength could handle. Slow deliberate wade on a small stream. Lots of skipping casts and patience. Man, these fish fought hard in that current. 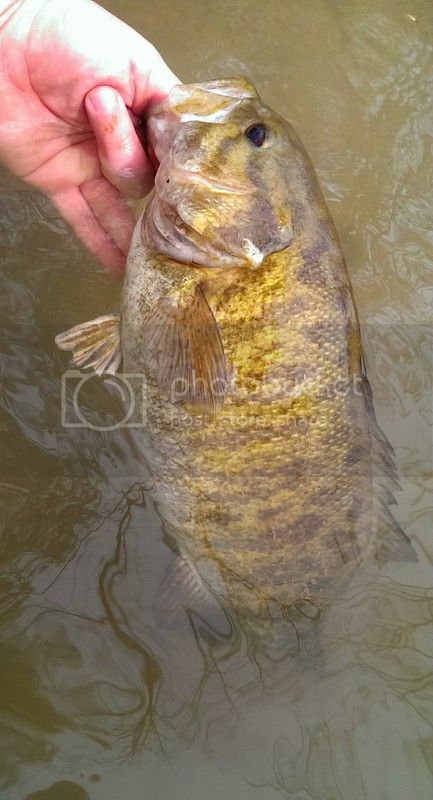 Really made me remember why I fish for smallmouth bass. 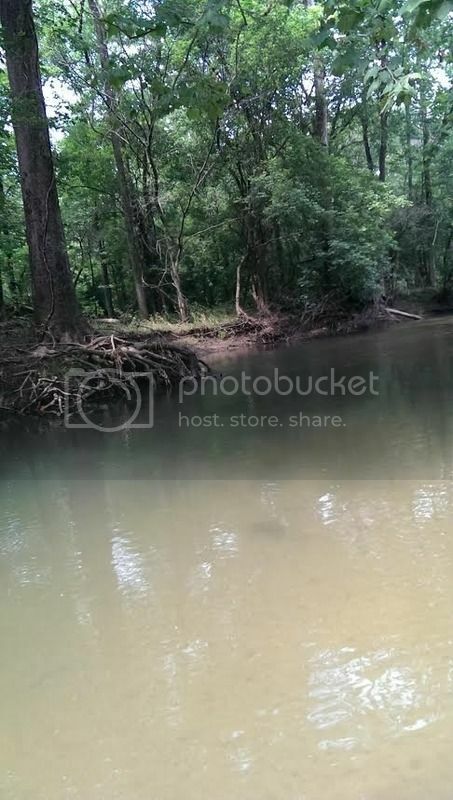 Surely, there wouldn't be any monsters in this small creek? Turns out the bigger fish wanted some rattle and speed to their crankbaits as the water warmed up. 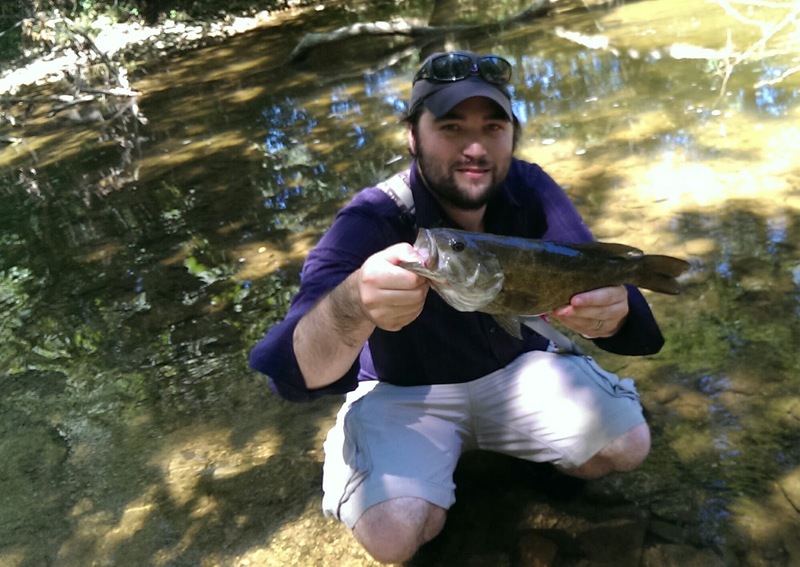 Bass were thick. 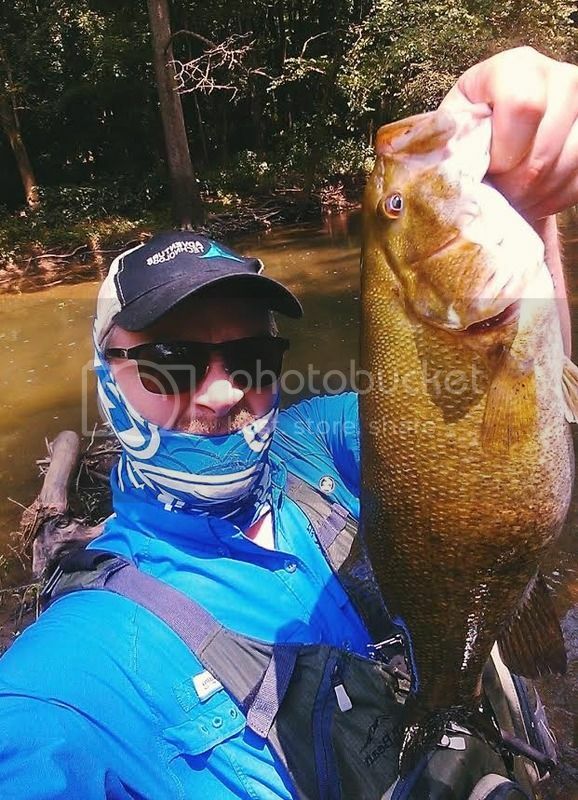 The largest fish went 19" and I'm guessing close 4 lbs, ridiculously fat. High water and new winter hole I found along the road. If not for old mono, I could have had 10 over 16" to hand. All fell to float and fly dragging jig on the bottom overlined.